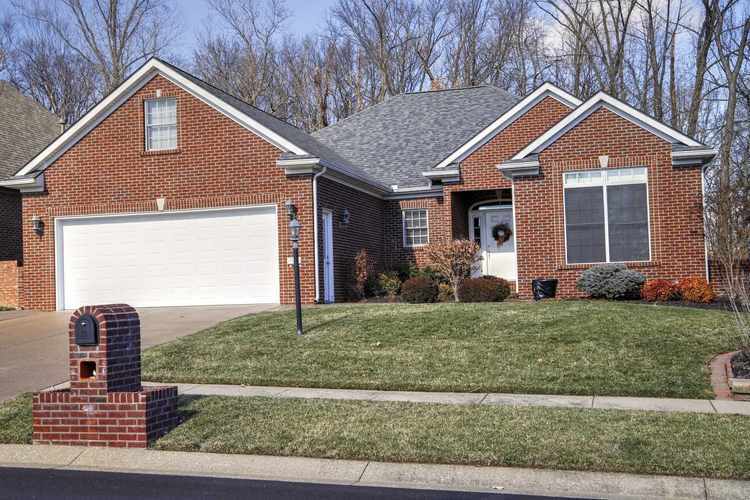 This immaculate 3 bedroom, 2 1/2 bath brick ranch home is situated in a desirable north side subdivision and offers an easily maintained, beautifully landscaped yard that backs up to the woods to view all that nature has to offer. The open floor plan begins with a maple hardwood floored foyer that leads to the spacious great room with double trey ceiling, crown molding and indirect lighting. The great room features a gas log fireplace, built in planning desk and large windows. There is crown molding throughout the main living area. The large kitchen features plenty of cherry cabinets, granite countertops, a breakfast bar with seating for 4 and opens to the large dining area that also has a trey ceiling. The dining area has beautiful windows and a walkout glass door to the beautifully stained deck. The newly carpeted spacious master suite has beautiful wooded views. The master bath offers a jetted tub, walk in shower and double vanity sink and leads to the large walk in closet. In this split bedroom design are two additional large, newly carpeted bedrooms with a full bath between them. Off of the kitchen is a half bath and laundry room conveniently located just inside the door to the garage. The 2 1/2 car garage is extra deep and includes stairs to the attic which is currently used as storage but could be finished and used as additional living space. The crawl space is approximately 4 feet tall with outside door access and is being used to store the lawn mower and various yard tools. The front yard has an irrigation system. Recent updates include master bath tile, wood flooring in dining and hall, carpeting, kitchen counters and sink, new roof, and gutter guards. Directions:From Highway 57, north on Petersburg, west on Championship, home on right.